Lazada's 6th birthday happens on the 25th of April. It might be their birthday, but with all the deals and discounts on products from Philips, Samsung, L'Oreal (and more! ), there's really no reason why you shouldn't treat yo'self! We all know that the best way to shop is when you're able to save while you spend, so now's the time to celebrate with Lazada... and take advantage of those flash sales and bundles. We also hear that the M.A.C Cosmetics store on Lazada is also being incredibly generous with their free gifts. You heard us; it's finally time to jump on that matte lipstick train! Not that you need another reason, but did we mention free shipping throughout West Malaysia? Well, now you know! 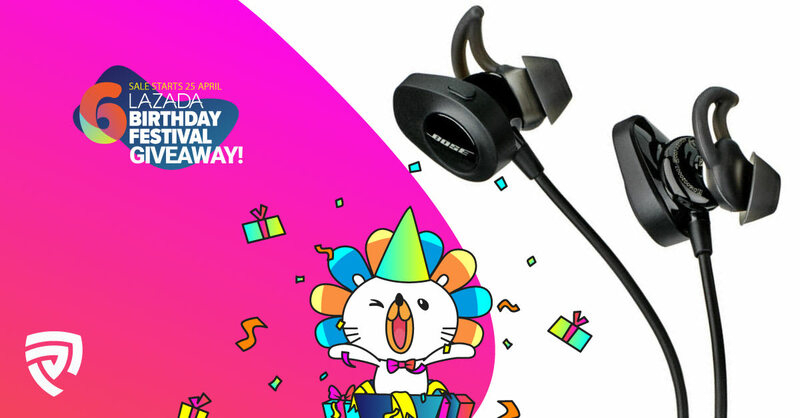 In conjunction with Lazada's 6th birthday sale, we are giving away a pair of Bose SoundSport wireless headphone worth RM700, 1 X RM200 Lazada voucher and 1 X RM100 Lazada voucher to three lucky readers. All you need to do is (1): insert your e-mail, and (2) answer the question below correctly. You're all set! Now just sit back, relax, and wait for our the lucky winner to be announced. Contest ends (27th April 2018, 10pm), so make haste! Read full terms and conditions here. FREE iPhone 7 Red or Huawei P10 Giveaway at 11Street!